The Accelerated Mobile Pages (AMP) was launched in 2015, and with this project, the Mountain View company attempted to speed up mobile web. It is a success with its implementation in search and the Google Feed, and now today we have got a information which is definitely going to delight all the users who search news articles on Google as the company now wants to make it more interactive. According to the Google Developers Blog, a new feature was revealed and it is called AMP story format. This feature will be great for news websites and blogs looking to provide image-heavy content. The feature works similar to the Instagram Stories, the web content will be displayed on the mobile display as a full-screen portrait image. When a user taps on different areas of the screen, they can scroll through the content with animations, texts, and even videos. If a user accesses the AMP Story via computer or non-smartphone device, then the story will be displayed in the same format just with the hazy background covering the areas of the screen where the story is not taken up. The Mountain View company says, the new feature will be faster and it will appear in the Google search results from today itself. 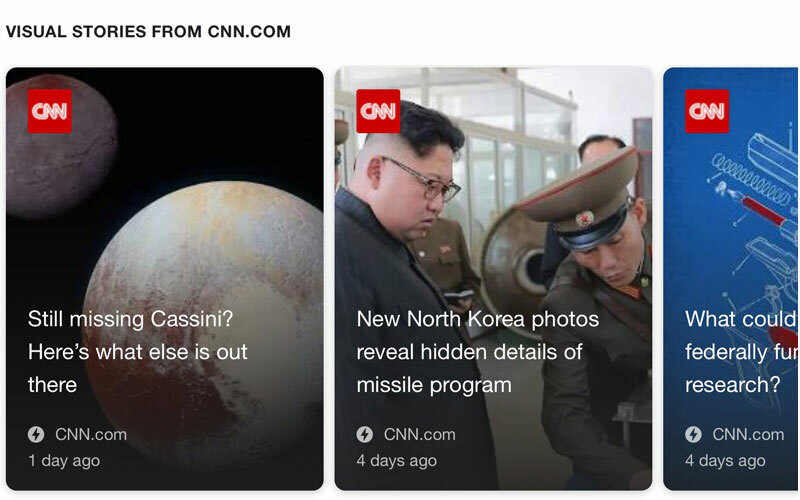 Right now, you can view a selection of stories by heading to g.co/ampstories on your mobile browser, when you tap on the link it will open the normal Google page then type CNN and you will get the search result page with CNN stories at the top. This feature will not be available on the desktop at this point.